How to plot (x,y,z) coordinates in the shape of a hexagonal grid? How can one plot this in Python so that the points on the plot retain that hexagonal shape? Additionally how can one represent the 'colors' list on the hexagon. But the look doesn't matter, just a simple scatter plot type visualization would suffice, just so that one can see where in relation to other hexagons the colors lie. You just need to turn the (y, z) coordinates from your hexagons into the y cartesian coordinate on the matplotlib axes. You can then add the hexagons using a matplotlib RegularPolygon patch, or plot the centres using scatter. 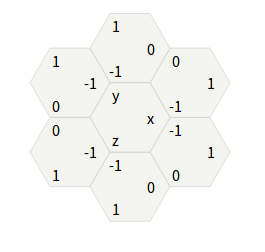 Email codedump link for How to plot (x,y,z) coordinates in the shape of a hexagonal grid?